DETROIT – GM engineers are putting the next generation Chevrolet Silverado through the final paces at the company’s proving grounds in Yuma, Ariz. 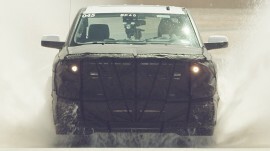 This water test is part of a rigorous product validation program that has helped make Silverado the most dependable, longest lasting full-size pickup. The new Silverado will start production in 2013.